A pretty cool movie with amazing visuals, until it becomes cast away in space and starts to lose our attention. A movie with a routine plot that is still pretty incredible simply because of the effects and approach. there aren’t many movies that spend nearly the entire duration floating around in the abyss of outer space. The routine stuff comes when characters keep getting separated from each other and eventually we get a cast away – one person on their own – type situation. Even still, the visuals here are incredible and director Alfonso Cuaron shows how a movie like this needs to be treated delicately in order to make something really special. 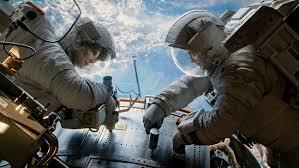 Gravity is definitely a cool movie. In fact, it might be the biggest sensation since avatar, four years ago. That’s because the movie was totally made for the IMAX 3D experience. Right now, it is dominating the box office, and has been for weeks, mostly due to IMAX 3D sales. It’s the only way to see a movie like this, and boy is it an incredible experience. I’m not really talking about the movie itself, which has a story that is just average, but the effects, which are completely ground breaking. They up the level of the movie to the point where even if the plot is somewhat routine, we don’t really care. When I talk about the effects of this movie, I’m not so much talking about the look of outer space. There has been a lot of talk about how real this movie looks and how it seems as if they really did shoot it in space, or how it wouldn’t look any better if they had actually gone into space to make the movie. None of that means anything to me, simply because I’ve never been in space and have no idea what it really looks like. I expect the movie to look like the characters are really in space, and so that part isn’t really the surprise. the surprise is how great this movie uses space. it is truly the backdrop of just about the entire film. that means for most of the movie our characters are hovering right over planet earth. the sights, such as the sun rising and coming up over a side of the world, are incredible. so is the artistic way the movie approaches everything, using sound as a tool on a number of occasions, to enhance the viewing experience. sometimes the movie cuts the sound all together and the silence allows us to focus on the tension of what’s happening. other times, we listen to music being played through lousy speakers, just the way the astronaughts are listening to it. this music sounds like something coming through a broken stereo system in an old deserted ghost town movie. the movie is about two astronaughts in space. they have been sent up to use a new piece of equipment in order to repair a problem on a satelite. at the start of the film, we slowly move around the earth as a satelite gets closer and closer to us. when it finally gets close enough that we can make things out, we see Matt kowalski (George clooney), floating around, having the time of his life. he moves in and out of the screen, and on top of the that, the camera keeps moving around him. this opening shot is incredible, and really sets up the level of how much this movie can do. the story begins shortly after, and it’s basically just he and ryan stone (sandra bullock), up there in space, working on the satelite. they have fun conversations, and matt tells a bunch of stories. he’s an interesting character, and it’s nice having the two of them together, wathcing their back and forth banter. she’s the nervous one on her first mission, and he’s the expert, out there on his last one. the idea of a guy on the final mission of his career is a cliched one (it’s usually a robber pulling one last job or a cop taking one last case, like morgan freeman in seven), but at least here, it’s used in a setting that we’ve never seen before. on the topic of the setting, we’ve seen countless movies in space, but very few of them that really spend the bulk of the movie in the abyss of space. most movies put the characters on the surface of another planet, or inside a space shuttle. this one has them mostly outside the shuttle, floating around. it’s pretty cool stuff, and that’s definitely what leads to us getting many unique shots. this movie is unlike anything else, and the simple premise that puts these astronaughts out there, in the open, completely vulnerable to anything that comes their way, is a major reason for it. after we have settled in a little bit, and gotten to know the characters and the situation, the real story takes off. just when we were getting comfortable, matt receives a transmission that there is lots of debris headed their way. he tries to get ryan to leave what she’s doing, but she is almost done, and resists him for a few seconds. then she lets it go, and listens to him, but it’s too late. all of the debris comes right at them. it hits hard, killing a third crew member who is with them, and we get to see a crazy shot of what it did to this astronaught’s face. ryan gets separated and is off on her own for a while. she can’t stop her body from flipping around in circles, over and over again, and we can only imagine what it must feel like inside her gear. it gets so dizzying that we can’t even handle watching it anymore, sitting in our chairs, and so the movie cuts away. we move further and further away from ryan as she drifts off into space, and we are left thinking about how she is off somewhere, still flipping around in circles. matt finds her and rescues her, and everything seems great, until there is another problem, and one that the two of them can’t control. this time, the two of them are stuck in a situation that is absolutely life or death, and by the end of it, they have separated once more. this is where ryan is left on her own, for pretty much the duration of what remains of the movie. once clooney exits, the movie starts going downhill fast. just having someone to talk to and bounce humor off of, gave this movie life. with clooney gone, bullock literally goes from moving around space to crawling into a shuttle compartment, staying still, and even falling asleep. there’s nearly half of the movie left, and this is where it starts to get dull. the movie becomes like another version of cast away. it drags and loses our interest, and makes us really miss george clooney’s presense and playful banter. gravity looks and feels amazing. the story could certainly have been better. after all, broken down into it’s parts, this is really just the story of bullock and clooney working together and then getting separated, then doing those things again. bullock is a fine actress, but she’s not someone that we want to watch all by herself. few movie stars actually are. tom hanks was okay in cast away and will smith was okay in i am legend, but for the most part, there needs to be at least one other character around to maintain conversation. sam rockwell pulled off the one man on his own situation better than anyone in the movie, moon, but even that would have benefitted from the involvement of another actor. 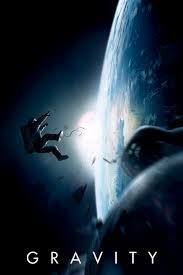 gravity is a very cool movie with a very average plot.